Among the five new Android Froyo tablets unleashed by Archos, the flagship model is the most eye-catching portable media player. Sporting a 10.1-inch screen, the tablet plays your favorite HD videos and view photos out-of-the-box. And ARCHOS makes your life easier by supporting audio and video formats beyond the standard ones of Android, including AVI, MP4, MKV, MOV, WMV, MPG, PS, TS, VOB, FLV, RM, RMVB, ASF, and 3GP. 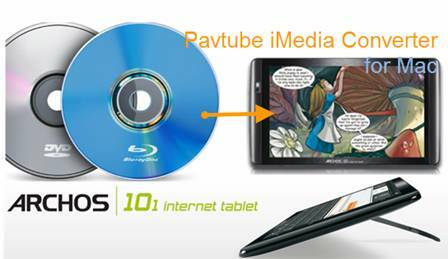 If you also feel like watching Blu-rays, DVDs and videos of other formats on the Archos 101 tablet, here’s a Mac app that converts BDs, DVDs and Videos to Archos 101 supported video formats up to 720p- the Pavtube iMedia Converter for Mac. 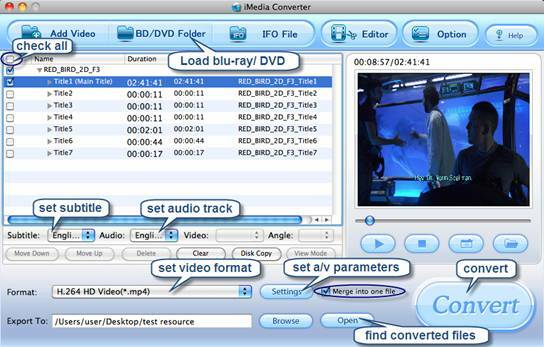 Pavtube iMedia Converter for Mac is able to finish conversion at super high speed, and will never let you encounter troubles caused by out of sync. In addition, it adopts unique built-in codec, which can absolutely ensure not to install any codec on your computers to disturb the original systems. You may download and install trial of the Mac Blu-Ray Video to Archos 101 Converter and try it out. It is 100% clear software and allows you to access all the functions. Step 1. Run the Mac Blu-Ray Video to Archos 101 Converter and import source media. Note that if you are about to rip blu-ray disc on Mac, an external BD drive is required for loading blu-ray movie. Once run the iMedia Converter for Mac software, click “Add Video” to load your video files like MTS/M2TS, MKV, MOV, TOD, TiVo, etc. The Mac Blu-ray DVD to Archos 101 Converter is able to decrypt commercial blu-ray discs and protected DVDs, all you need is to put blu-ray disc/ DVD to BD drive, and click on “BD/DVD folder” to load the movie. To combine several items (video, DVD and Blu-ray movie) into a single file, just tick off the checkbox of “Merge into one file”. If your sources are video files, please skip this step. For BD/DVD to Archos 101 conversion, you may set audio track and subtitles. To set Audio track, click on the Audio box and select an audio track with desired language. Set subtitles in the same way. There is a box of “Force Subtitles” too. In preview window you can observe the effect. To play videos on Archos 101, you need to set a compatible format for the tablet. Pavtube iMedia Converter for Mac provides presets for Archos 5, Archos 7, Archos 605, Archos 705, Archos 704, Archos 504, Archos 604, etc. You may click on the pull down menu of “Format” to choose a format for the tablet. Converting SD videos to Archos 101: When converting SD (4:3) video to Archos 101, you can simply follow “Archos”>>“Archos 5/7 AVI Video (*.avi)”. 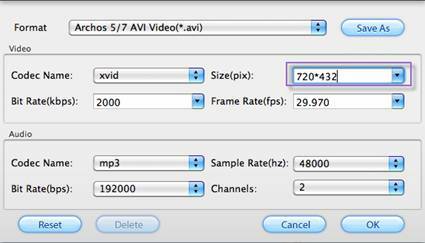 Converting DVD movies to Archos 101: Set “Archos”>>“Archos 5/7 AVI Video (*.avi)”, then click on “Settings”, find video “Size” in the Settings window, and put in 720*432 so that the DVD (NTSC, 720*480) will not lose aspect ratio when watching on Archos 101 tablet. Ripping HD video/Blu-ray Disc to Archos 101: When converting HD video (16:9) and commercial Blu-ray movies to Archos 101, you can keep the HD video quality by selecting “iPad”>> “iPad HD Video (*.mp4)”. This format creates 720p H.264 MP4 video that plays just fine on Archos 101 internet tablet. Step 4. Start converting Blu-ray/DVD movie and videos to Archos 101 video on Mac. Now click "Convert" button to start ripping Blu-ray and DVD movie to Archos 101, or converting video to Archos 101 video. When the conversion task is finished, you can click “Open” button to get the final output files for your Archos 101 and transfer the converted videos to Archos 101. Generally the Blu-ray ripping process cost hours. In order to save time, you can click on the “Option” menu, and tick “auto shut down computer after conversion” box so that the app will shut down your Mac upon the completion of ripping. 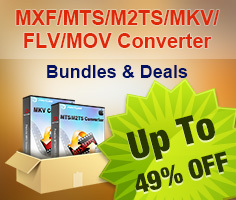 With the above codecs, the device can play video files with the following extensions: AVI, MP4, MKV, MOV, WMV, MPG, PS, TS, VOB, FLV, RM, RMVB, ASF, 3GP.